In order to understand the present of Vietnam (Việt Nam), you have to look to its past, and that also includes the tragic stage of the Vietnam War, or the American War as it was named in Vietnam. 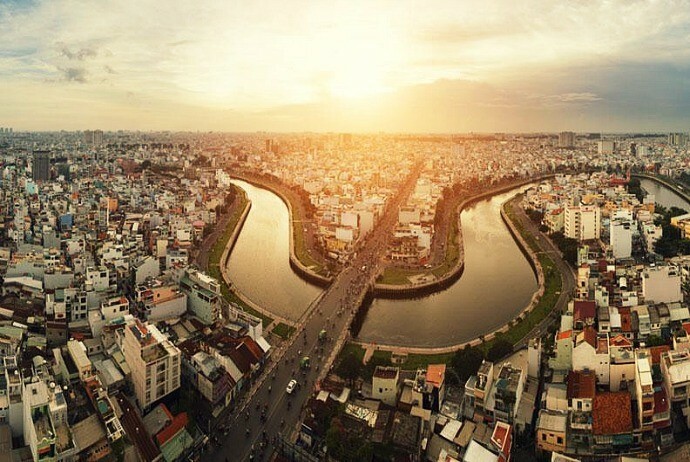 The area surrounding Ho Chi Minh (Hồ Chí Minh) City, also known as Saigon, sat right at the centre of the conflict, and the tourists visiting the southern city could still witness the legacy of this war in a lot of its tourist attractions. This article will list down 10 out of best Vietnam War tours that you may be interested. Take a look! One of the most popular Vietnam War tours of Ho Chi Minh City is the tour to Cu Chi (Củ Chi) tunnels. This is an underground passage network stretching of about 120 miles which was established by the Viet Cong (Việt Cộng) as a means of protection from air raids and for infiltrating to the whole area surrounding the capital of South Vietnam. Situated at about 30 km (20 miles) from Saigon’s city center, the tunnels once held living quarters, hospitals, schools, meeting halls, and booby traps to prevent the unwanted intruders from breaking through. With this tour, tourists could learn about the hardships suffered by Vietnamese people on both sides of the conflict whilst still exploring the claustrophobic passageways. The Cu Chi Tunnels tour with Saigon (Sài Gòn) River Speedboat Cruise from Saigon represents a few of the most unique parts of the rich history of this incredible country. The day tour of small groups begins with an air-conditioned transfer to a thrilling speedboat on Saigon River, leading to a tour of the impressive network of underground tunnels which was used as a hideout for those local villagers during the period of Vietnam War. Also, you will select between a visit to the cricket farm or a house where you can learn how traditional rice paper will be made. With the cap of eight individuals, you are sure to get personal attention whilst learning about Vietnamese history and life. Your tour guide will meet you at your hotel, and then transfer you to or from the Cu Chi Tunnels in the thrilling speedboat. Spend several minutes watching the informative video upon arriving at Cu Chi Tunnels, explaining the purpose as well as the construction of this network which was built during the period of Vietnam War. 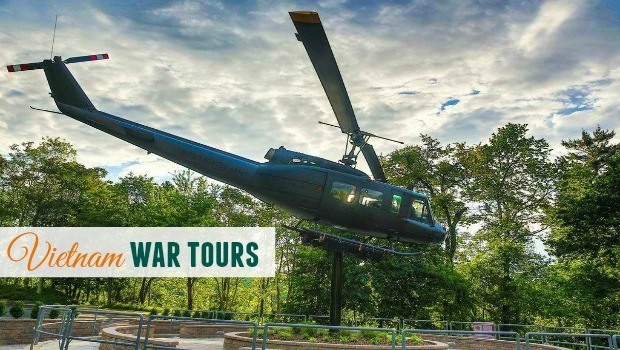 Follow the tour guide via narrow passages and hear first-hand about the important, even vital, role they played in protecting local people and securing victory for Vietnam during the war. Your tour guide will explain how these channels served as an operation base during Vietnam War, used majorly as communication and supply routes and living quarters, hospitals and even a storage place for food, weapons and Viet Cong fighters. You will see a portion of this 75-mile-long (about 121-km) complex, containing booby traps which are well marked, military meeting rooms, when you wander the historic site, which is partially preserved as the park as war memorial. If tourists select to visit the cricket farm, they will transfer from the hotel in the morning by vehicle with air-conditioned to Ho Chi Minh Pier. There, you can take part in an appropriate speedboat ride lasting for 2 hours to Cu Chi Tunnels. When you cruise on the Saigon River, you will take in the fascinating river life and scenery while leaving bustling cities behind. Your tour guide will show houses on stilts lining the riverbanks, and tell you about local people whose livelihoods rely on the waterway. After enjoying your speedboat trip and tour of Cu Chi Tunnels, you will be driven through the suburb for a tour to a cricket farm. Crickets are reckoned as a delicacy by Vietnamese people. 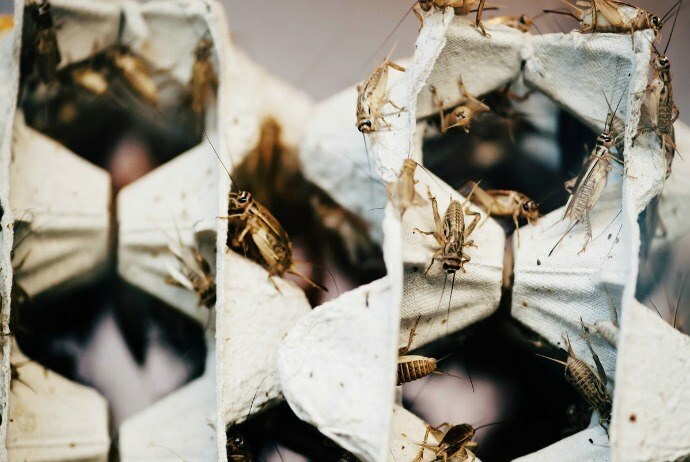 At this farm, you will see crickets in different stages of growth and witness them being prepared as unique food – if you want. Even, you will have a chance to sample a dish with rickets as a base. Upon your return to Saigon, your tour guide will stop for a tasty Vietnamese lunch (not including crickets) before coming back to your hotel in the late afternoon. Yet, it is worth noting that basing on the availability; it is possible to travel to Cu Chi tunnels by vehicle and return by speedboat to Saigon, stopping for lunch on the riverfront. In case you choose the option of paper-making, your tour guide will pick up you at the hotel in the morning, and then transfer to Cu Chi Tunnels by vehicle with air condition. 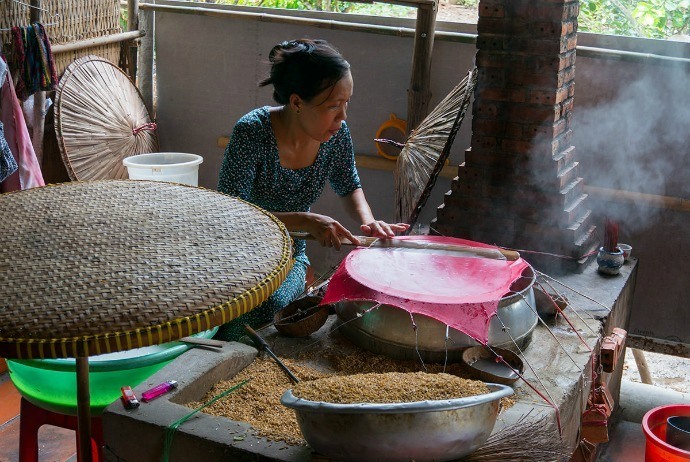 On your trip to the Cu Chi tunnels, you also visit a Vietnamese family where traditional rice paper is made by hand. Whilst the paper is used in traditional spring rolls, the rick husks are also made used for fuel. Listen as your tour guide explains the process of cooking over a kitchen made of sand and bricks, and learn about the process of drying that takes places in the sun. After that, you depart by speedboat to cruise the Saigon River, stopping for a delicious Vietnamese lunch on the riverfront. Then, you hop back on a boat to the pier in Saigon before coming back to your hotel at late afternoon. Yet, it is worth noting that basing on the availability; it is possible to travel to Cu Chi tunnels by speedboat, and return by land vehicle to Saigon, stopping for lunch. Minimum numbers apply. There is a risk of cancellation after confirming if there are not adequate passengers to meet the needs. If this case happens, you will be offered a full refund or an alternative. 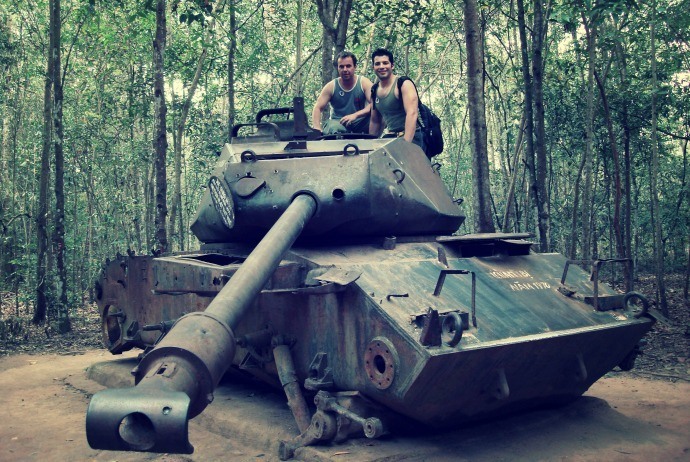 When it comes to Vietnam War tours, this tour will allow you to discover the secret world of Cu Chi freedom fighters on a half-day tour from Saigon. With a knowledgeable tour guide, descend into the subterranean tunnel network, and gain an insight into the impressive history of the 200km labyrinth. Here, you will hear about how tunnels operated as a busy underground city and discover the pivotal role of the structure in the American War. While joining in this tour, you will be able to enjoy the convenience of the round-trip transportation from your hotel and get personalized attention from the tour guide on the tour. The tour includes a tour guide speaking English well. 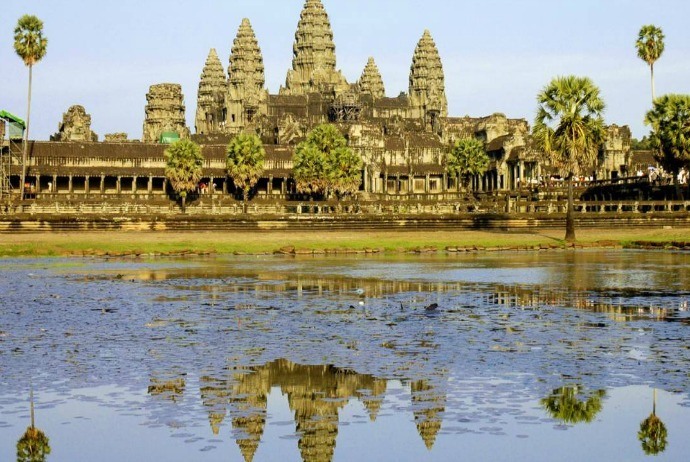 Escape the metropolitan mayhem of Saigon in an air-conditioned, comfortable coach and travel west towards the border with Cambodia. There, during the trip, you will enjoy the scene of countryside when you travel to Cu Chi Tunnels while listening to your tour guide relating about the historical scene of this subterranean structure. With this tour among some other Vietnam War Tours, as a passenger, your knowledge will be enriched with the information about the American War. Also, you can discover fascinating facts about how these tunnels were established by Viet Cong fighters as the base from which they could operate. Your tour guide also provides you with information about the functions of these tunnels and how hospitals, schools, sleeping quarters and meeting rooms comprised the city. After knowing those details, you will understand the hardships faced by Vietnamese living below ground. After contemplating the whole Cu Chi Tunnels, you will emerge into the daylight and come back to Ho Chi Minh City. Confirmation will be gotten at the booking time, if not booked during 2 days of travel. In such case, confirmation will be gotten during 48 hours, depending on the availability. For this small group, full-day tour, you can immerse yourself in the dynamic atmosphere of Saigon. Get fascinating insight into the rich historical and cultural heritage of the city when you explore significant attractions with an interesting, knowledgeable tour guide; marvel at the nice Giac Lam (Giác Lâm) pagoda; shop for souvenirs at Ben Thanh (Bến Thành) markets; and feast your own senses on a lunch of traditional Vietnamese specialty. Then, you can visit one of the most famous attractions in Ho Chi Minh City – the Reunification Palace to learn about the turbulent history of the country and conclude your travel day with a serene stroll down tree-lined boulevards. 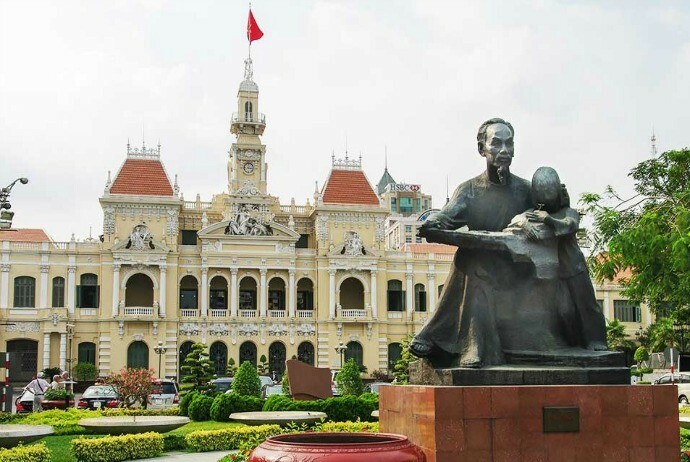 See instances of the French colonial period of Ho Chi Minh City with visits to War Remnants Museum, Notre Dame Cathedral, the Reunification Palace, Opera House, and Central Post Office. Start from your hotel in an air-conditioned, luxurious coach. Being your tour at Giac Lam pagoda, which is an impressive 17th-century located in the centre of the city. 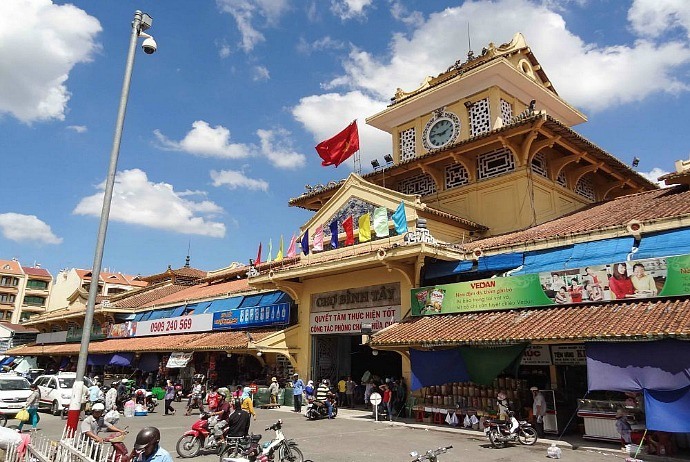 After listening to the intriguing history of the structure, you continue to Chinatown to immerse yourself in such a bustling atmosphere of markets such as Binh Tay (Bình Tây) and Cholon (Chợ Lớn). After that, you can absorb the sacred atmosphere at Thien Hau (Thiện Hậu) temple, a revered structure dedicated to Thien Hau, the goddess of the seafarers and established in the 19th century. Next, you head to the Ben Thanh Market to peruse the stalls that burst with exotic produce. Here, you could practice your language skills as well as listen to the history of this market from your tour guide. Also, you can revitalize with a traditional, tasty Vietnamese lunch before venturing to the War Remnants Museum in order to witness the selection of antique military equipment, including a F5A fighter and an enormous UH1-Huey helicopter in the court yard. Then, you stroll to the Reunification Palace where you can see impressive tableau architecture of Vietnam. In addition, here you can admire the French colonial facades of the Opera house, Notre Dame Cathedral, and the Central Post Office. Next, you explore the region individually or take a cab back to your hotel with the support from your tour guide. Port pickup is not available because of required permit. Hotel pickups will be carried out prior to this time, you have to contact with the local service supplier in order to verify your precise pickup time. Times will be subjected to change because of the local traffic conditions. Return details: the tour finishes at about 4:30 pm. Your tour guide will help you get a cab back to your current hotel. In regard to Vietnam War tours in Ho Chi Minh City, this is considered as the most comprehensive one which allows you to stop at nearly all of the highlights of the city. The full-day private tour will give you a chance to visit some of the most well-known cultural, historical, and architectural sites such as the War Remnants Museum and Reunification Palace. Tourists will also get to witness the influence of France on this Southeast Asian city during stops at the Post Office and Notre Dame Cathedral, and sample traditional specialties in a typical Vietnamese lunch. After having a lunch, tourists will comb through the stalls of the famous pagoda – Giac Lam. Head to the Chinese district of Cholon (Chợ Lớn) along with Ben Thanh (Bến Thành) Market to test your bargaining skills and select some types of souvenirs for your return trip. You will be picked up and dropped off by vehicle with air condition. Ho Chi Minh City, also known as Saigon, blends Chinese traditions and French colonial architecture to form a spirited city which is filled with museum, temples, and rich history. The private tour features with a stop at the Post Office and the nearby Notre Dame Cathedral, both fine instances of the French colonial architecture. Joining in this 4-hour tour, you will be able to discover the vibrant atmosphere as well as bustling streets of Saigon. During the excursion, you will visit popular local haunts with a knowledgeable tour guide and contemplate legendary landmarks such as Notre Dame Cathedral and Post Office. 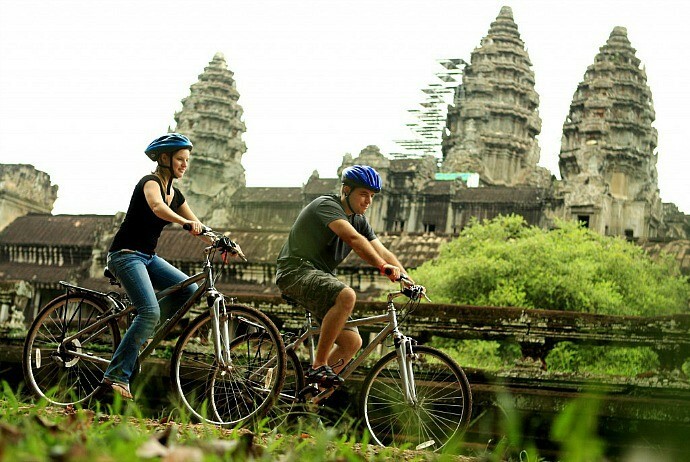 You also explore by yourself the rich cultural tapestry of Saigon on a bicycle or on foot. Delve into the turbulent history of Vietnam at War Remnants Museum and enjoy private attention from your tour guide on this tour. You can ride through Saigon’s vibrant streets in a cyclo, which is a three wheeled bike. Meet your tour guide the Central Post Office and contemplate fabulous façade of this structure. Then, you stroll to the famous Notre Dame Cathedral and the fine French colonial structure before capturing photos of the Presidential Palace. The tour guide will provide you with information about the turbulent past of Ho Chi Minh City with a visit to the War Remnants Museum. Visit the exhibitions displaying old military equipment and a colossal UH1-Huey helicopter before returning to the present during an explorative ride on a three wheeled bicycle – cyclo (xích lô). Then, admire the bustling city streets when your driver goes through the rich tapestry of the city center; see the beauty of Tao Dan (Tao Đàn) Park and breathe in the aromas of Tan Dinh (Tân Định), the wet market that is replete with different exotic ingredients. Complete your excursion in the well-known Ben Thanh Market, a colorful enclave filled with stalls selling majestic merchandise. Here you can use your bargaining skills and listening to your to your guide telling about the interesting origin of the market. Bid farewell to the tourist group at Ben Thanh Market and continue discovering the vibrant city independently. Return details: the tour finishes at Ben Thanh Market. Your tour guide will help you get a cab back to your current hotel. This is a private tour departing from your hotel and walks you through the most well-known examples of history and religion in this French-impacted city. 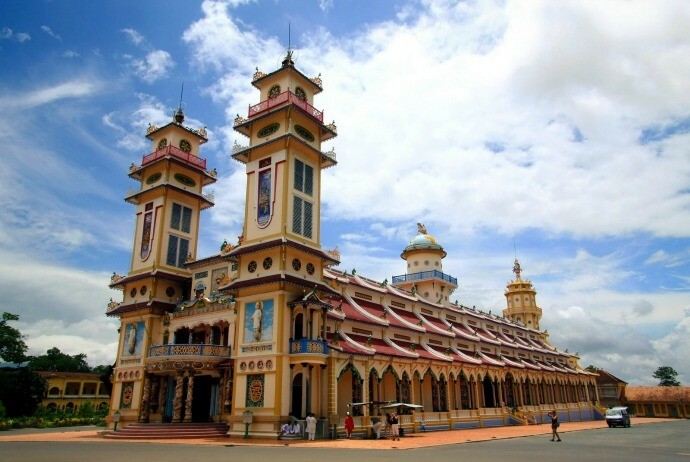 Make a stop at Tay Ninh (Tây Ninh), where you can learn about Cao Dai (Cao Đài), mixing Taoism, Christianity, Confucianism, and Buddhism into the only sect. Then, you can enjoy a local lunch before visiting the underground world of Cu Chi Tunnels which is an underground narrow passage network protecting Vietnamese people and military during the Vietnam/American War. Pickup and drop off from/to your hotel by private vehicle with air condition. Your full-day, private tour is the journey towards the Cambodian border and a stop at Tay Ninh (Tây Ninh) province. You will learn about how the religion blends Confucianism, Buddhism, Taoism, and Confucianism into just a singular belief. Next, you will visit Cu Chi Tunnels, the underground of narrow passage network stretching about 75 miles and connecting Saigon (Sài Gòn) to Cambodia and played a vital role in the Vietnam/American War. Tourists will truly experience the life underground when they step back in time. This private tour also includes a round-trip transfer and local lunch. With this half-day tour, you can see all of highlights with Saigon River Speedboat Cruise. The tour guide will take you along with your group on the behind the scenes that look at several of the brightest sites of the city. 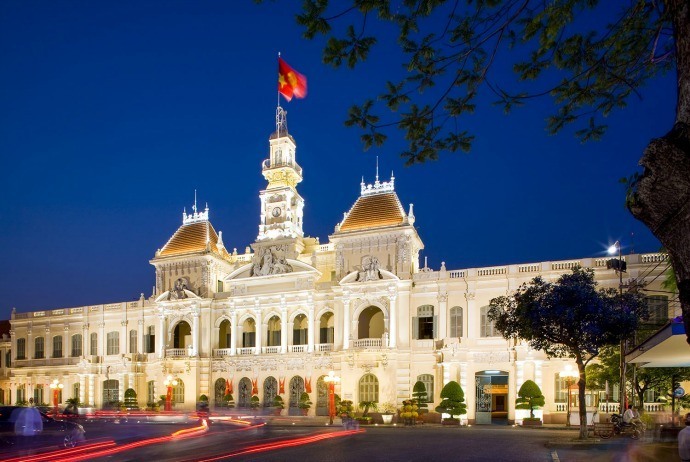 Visit Central Post Office, Saigon Opera House, Notre Dame Cathedral, and learn about the impact of French colonizers on the architecture of Vietnam. You can wander around the busy streets and make stops at the War Remnants Museum where you could learn about how the old war-torn Saigon developed into such a prosperous city like Ho Chi Minh City nowadays. After exploring on your foot, you then can hop abroad a speedboat for a ride along Saigon River and explore the scenic beauty of sunset over the gorgeous waterway before coming back to shore. Your tour guide will see you at your hotel and transport you in the vehicle with air condition around the stunning city. During the tour, you will visit top popular attractions, including the War Remnants Museum. Here, you will learn about the national history of the American/Vietnam War from your knowledgeable tour guide. After contemplating some architectural structures of the city, you head to the Reunification Palace, which used to be the workplace of the president of Vietnam, Central Post Office and Notre Dame Cathedral. From here, your group will head to bustling Dong Khoi (Đồng Khởi) Street, the district well known for quiet cafes, trendy boutiques, tasty restaurants, and luxurious shops. You can also wander around Saigon Opera House in which the local symphony and ballet perform. 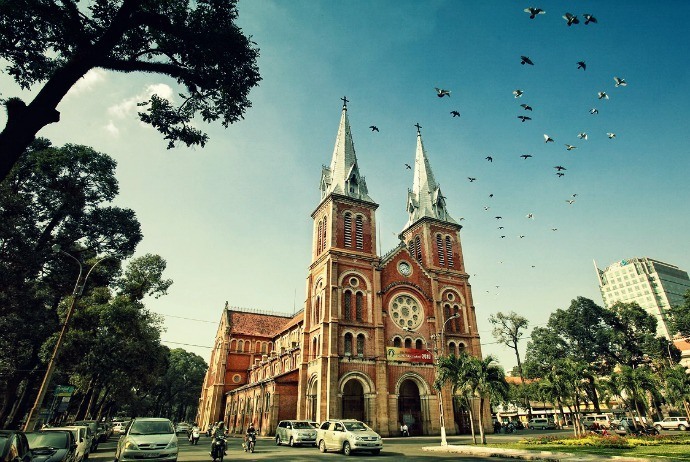 Here, you will listen to some famous stories about this Gothic structure serving as a refuge for French Citizens in the north area of Vietnam during World War I. 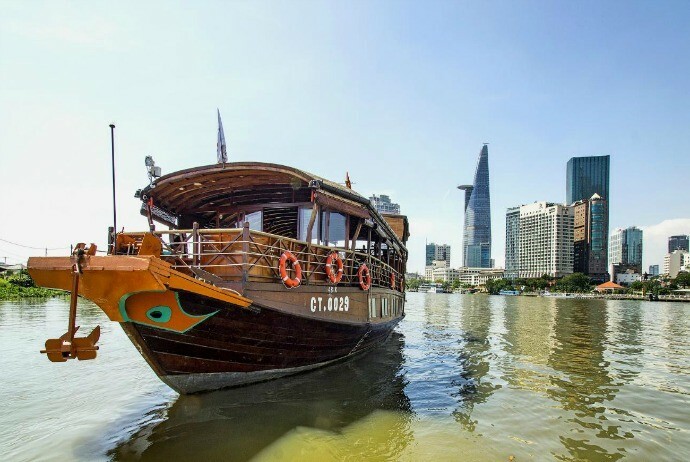 After experiencing Saigon’s highlights, you round out your urban experience with an exciting speedboat ride along Saigon River. 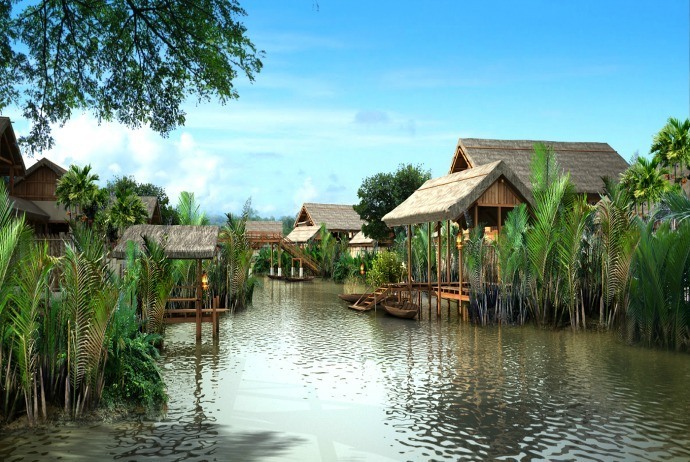 You also voyage past a few traditional stilt houses and get to know about the life of local people who rely on the river for their own livelihood. What interesting about this tour is you can enjoy sunset views along with warm breezes aboard the speeding ship before coming back to the shore by 6 pm. Then, you will be transferred to your hotel in the air-conditioned vehicle. A proper amount of walking will be involved, so it is recommended to use comfortable walking shoes. In regard to Vietnam War tours, this is a common one. Choose this tour, you will enjoy a full-day excursion with the personalized tour guide showing you iconic sites in Saigon in the morning before heading to Cu Chi Tunnels in the afternoon. Then, admire some of the most famous French colonial architecture at Notre Dame Basilica and Saigon Central Post Office before going to Chinatown, also called as Cholon (Chợ Lớn) in Vietnamese, to see the Central Market and Thien Hau (Thiên Hậu) temple. After having lunch, you will be driven to Cu Chi Tunnels to discover the incredible tunnel network. This tour includes round-trip transport using private vehicle. Pickup and drop off by comfortable, private vehicle with air condition. To start your personalized sightseeing tour, you will be picked up at your centrally located hotel. Then, you will head to some highlights of Saigon on the morning tour. Go around the city in the air-conditioned vehicle with your tour guide. During your visits to French colonial landmarks like Central Post Office and Notre Dame Basilica, you will hear about the history of France in Indochina, in general, and in Vietnam, in particular. After that, you head over Cholon, also known as Chinatown, to witness Thien Hau Temple built in the 19th century which honors the goddess of seafarers, Thien Hau. Next, you visit the bustling Binh Tay Market where Chinese people have established thriving stalls selling everything from consumer goods to produce. Have lunch in Saigon before setting out on the scenic 2.5 hour drive to Cu Chi Tunnels. 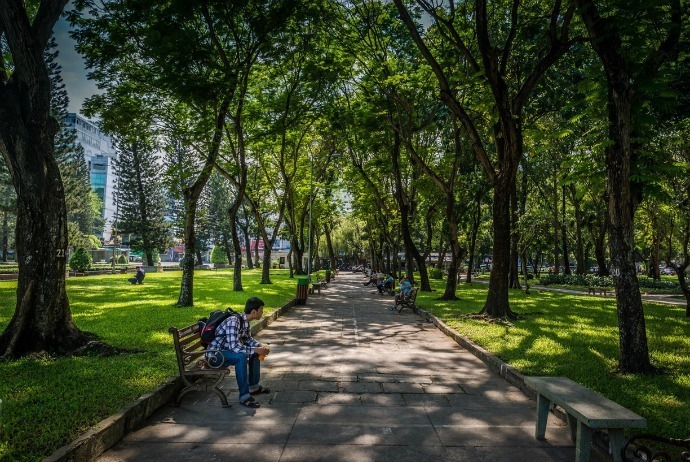 It takes about 46 miles (75 kilometers) to Cu Chi Tunnels from the war memorial park. This tunnel network used to serve as the military base for about 10,000 Viet Cong troops. Inside the tunnel complex, you can find military war rooms, kitchens, hospitals, schools, weapons, and enemy booby traps. A few of the tunnels have already been widened and set with lights so visitors could see more easily. Above ground, there is a photo gallery detailing the historical importance as well as construction of the tunnel complex. At the end of the tour, you will be transported back to your hotel in the late afternoon. With this 4-day tour, you can see two faces of Vietnam upon travelling from the skyscrapers of Saigon to those floating villages of Mekong Delta. Being called as the “rice bowl” of the country, joining this tour, you will have a chance to travel with an overnight cruise and experience homestay in the Mekong Delta, and travel by bike, xe loi (xe lôi), and rowboat around islands. When coming back to the city, you also tour the legendary historical site Cu Chi (Củ Chi) Tunnels, browse Chinatown markets and contemplate Cao Dai (Cao Đài) Temple. The maximal number of tourists in this small tour is 12. It also includes meals and accommodation. The tour lasts for 4 days, traveling through Ho Chi Minh City, Mekong Delta cruise, and Cu Chi Tunnels. 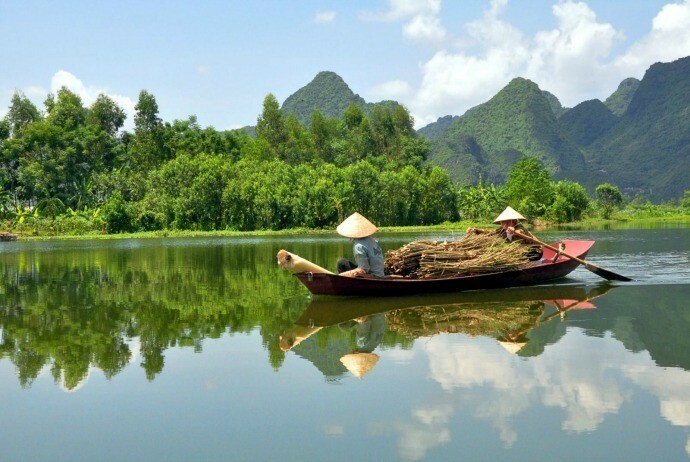 Your tour of southern Vietnam will take you via the bustling streets of Saigon, the underground tunnels of Cu Chi Tunnels and the renowned canals of Mekong Delta to experience such an authentic daily life of local people. Your extraordinary journey includes 2 night accommodations at your own choice of 1 to 2 start hotels in Saigon along with a one-night Mekong Delta homestay with the local family. You will feel like a local when you enjoy delightful local tropical fruits, taste Vietnamese food and chat with the hosts over a couple of home-style meals. 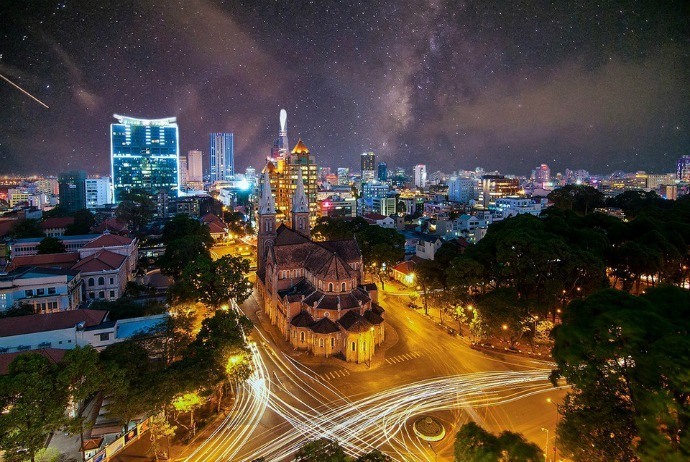 Ho Chi Minh City, a dynamic urban landmark, aka Saigon, brims with temples, street vendors, shops and French-influenced architecture in such an attractive blend of new and old. After you make your way to Saigon Opera House for meeting your tour guide, you start your tour to the Mekong Delta, the lifeblood of Southeast Asia. Just simply relax yourself on the drive lasting for 2.5 hours to My Tho (Mỹ Tho) City, a former naval base, now a busy port city and regular gateway to the delta. Your tour guide then will tell you about the fertile area of Mekong Delta, where about half of the food supply of Vietnam is delivered. On your arrival in My Tho, you can hop aboard a personal boat for a relaxing cruise on the Mekong River wends its way from Burma, Laos, Tibet through China, Cambodia, and Vietnam. Here, you can learn about the normal life of villagers, who tend to be more likely to travel by river than usual road, and who rely on the canal maze – brimming with tropical foods and markets – for their own livelihoods. Also, you will gain an insight into the cottage industries of the area with a visit to the local fish farm and a stop at the island owning lush garden for sampling tropical fruit. The tour guide will take your group to another beautiful island for visiting local candy and coconut factories, where you can learn about the process of producing the sweets. Keep visiting the island by motorized cart, also known in Vietnam as xe loi (xe lôi), visiting the bee farm before moving to smaller rowboats. Then, you can head to smaller canals for a visit to local villages and learn more about various traditional customs of people originating from Mekong Delta. After enjoying your sightseeing, you stop at a riverside eatery for a local lunch. The tour guide will supply some suggestions about local cuisines and also help you order local delicacies. 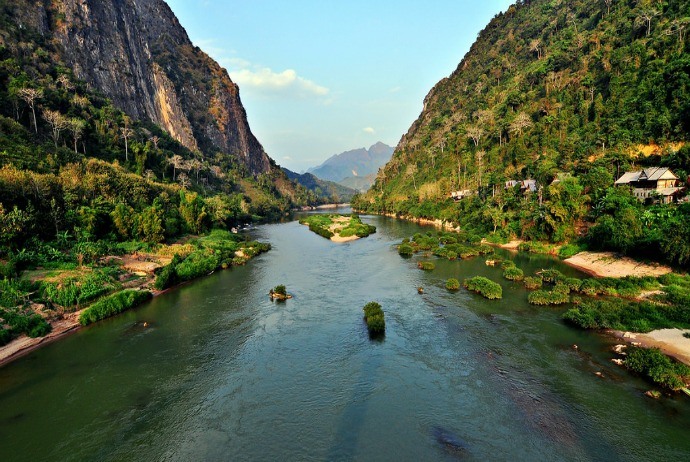 After having your lunch, continue the tour by using a rowboat to travel along the narrow waterways, passing one of the most beautiful islands of Mekong River – Phoenix Islet – where you can witness real images of fish farming by yourself. At the end of the day, you will arrive at a local family for your homestay. Here, there are about 4 acres (2 hectares) of garden offering seasonal tropical fruits like mangosteen, longan, durian, grapefruit and banana. You can also wander around the beautiful ground and share your dinner with your friendly hosts and tourist group. However, remember that dormitory-style facilities of the homestay are fundamental so you mosquito nets and bedding are highly recommended. In the next day, you awake early and hop on a bike through local paths to visit the local market where you can find piles of colorful produce. You will be welcomed to help your host prepared the lunch or do some gardening. After having lunch, you say goodbye to the host and return to Saigon. After doing all the necessary procedures of checking in to the hotel, you then can rest for the whole afternoon before exploring Ho Chi Minh City’s nightlife at your own leisure. The 3rd day of the tour, after having a breakfast at the hotel, you will follow your tour guide (with some other tourists) to walk through the back streets of Chinatown. Then, you can visit Thien Hau Temple, established in the early 19th century and honorably dedicated to Thien Hau – the goddess of seafarers. Next, explore the bustling markets of Chinatown – Binh Tay Market and Cholon Market – where street vendors can spread out their goods, from sophisticated electronics to soup. After that, stop at the local coffee shop and feel free to relax yourself over a tasty cup of authentic Vietnamese coffee when watching the fast pace of the urban lifestyle pass by in one of the largest cities of Vietnam. Following your visit to market, you slurp up a famous traditional cuisine of Vietnam – pho (noodle soup) for lunch before going sightseeing iconic buildings of Saigon. 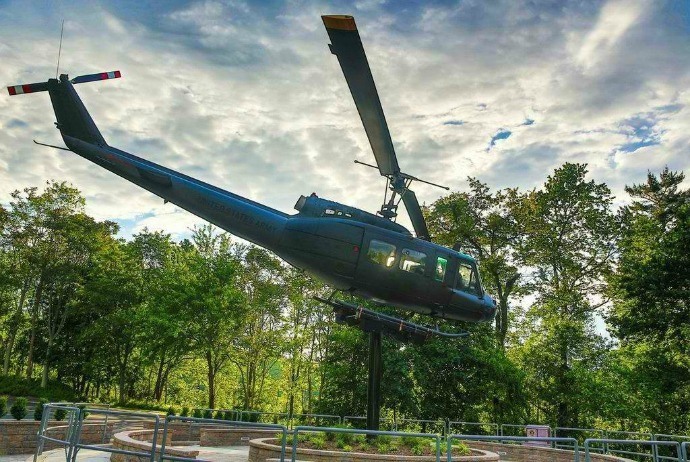 First, you will learn about the damage of the American/Vietnam War through a visit to the War Remnants Museum, where you can see displays of some old military equipment like F5A fighter jet or a UH1-Huey helicopter. Next, you head on a walking tour to the Reunification Palace, used to be known as Presidential Palace. Visit Saigon Notre Dame Cathedral, Saigon Opera House, and Central Post Office – all famous examples of French-influenced architecture. After leaving the busy streets of Saigon, you go on a 2.5-hour journey to Cao Dai Temple belonged to Tay Ninh (Tây Ninh) District. During your journey, along the way you will be invited to visit the home of a local family for such a real home-cooked Vietnamese lunch. 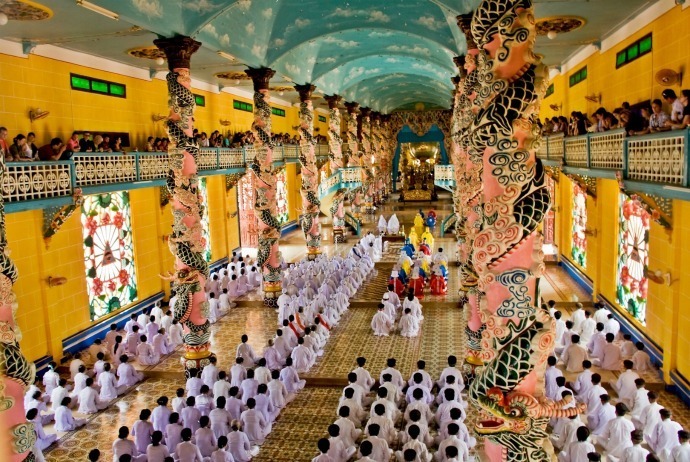 Your tour will arrive at the Cao Dai (Cao Đài) Temple in time to join in the noon ceremony and get an insight about Cao Daoism that blends some elements from Christianity, Buddhism, Islam, Confucianism, and Taoism. Here, you can admire the colorful and ornate tiles and pillars, gardens and religious murals of Cao Dai, meaning “abode or high place”, established in 1920s. 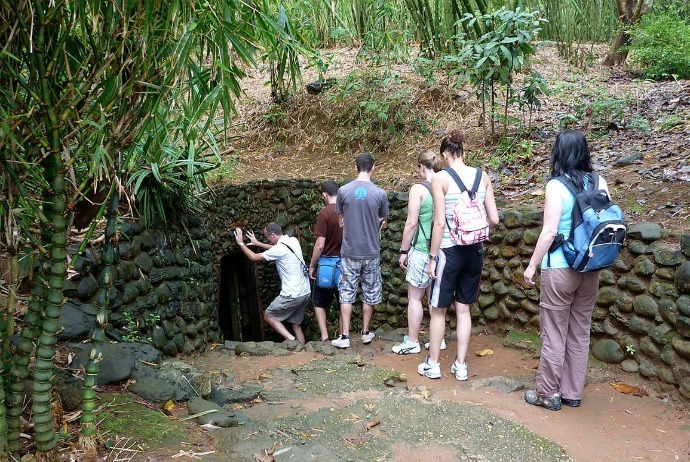 After that, your knowledgeable tour guide will get you further via southern countryside of Vietnam to the underground network of Cu Chi Tunnels, established by local soldiers during the Indochina conflicts as a tactic base from which Viet Cong (Việt Cộng) can operate close to the center of Saigon. The tunnel network encompasses about 200 km (125 miles), including schools, hospitals, meeting rooms, sleeping quarters and kitchens. 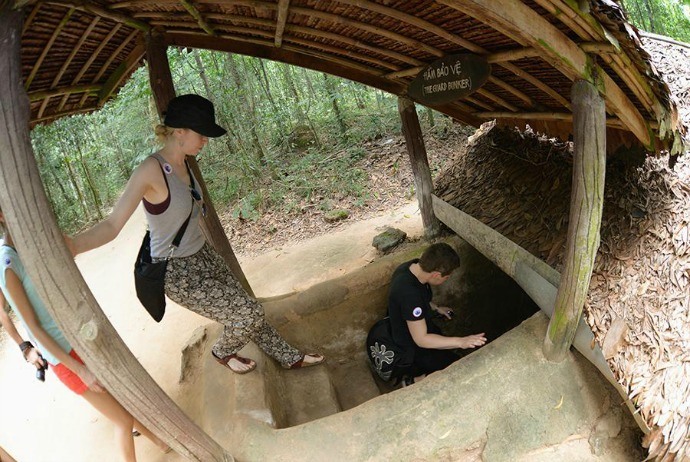 When you venture into the complex of Cu Chi Tunnels, your tour guide will tell you about the hard living conditions as well as the ingenuity needed in order to maintain the life underground. Wander through hug bomb craters, witness tiny chimneys dispersing smoke from the underground kitchens, explore hidden entrances, and even sample some simple cuisines that local fighters used to consume. When emerging above the ground, the guide will get you back to Ho Chi Minh City, at about 5pm. The accommodations for 3 nights in 2-star hotels as well as guesthouse. Confirmation will be gotten at the booking time, if not booked during 14 days of travel, depending on the availability. Every traveler under 18 needs to be accompanied by an adult. Travel insurance covering medical expenses such as emergency repatriation, is officially required to take part in the tour, proof of insurance have to be shown to the tour leader on the initial day of the tour. Your must include detailed information about your hotel in Ho Chi Minh City at the booking time. If this has not been dealt before your booking time, you have to contact the local tour operator at least 48 hours in advance. Accommodation: single room / double room. The last but not least interesting when it comes to Vietnam War tours is the tour that combines boat and bicycle in one. With this full-day tour, you can admire Ho Chi Minh City from various perspectives. Including a bike tour and a speedboat tour, this tour will begin with a cruise lasting for 1.5 hours along the Saigon River before embarking on a leisurely bike excursion along the jungle trails along with waterfront paths. Next, hop off to discover the Cu Chi Tunnels and take photos inside war bunkers and hideouts. Complete your trip with a typical Vietnamese lunch before coming back to the minivan. This tour with a small group includes maximally 8 people, making sure a personalized experience for tourists. Explore the rural area on a fascinating 2.5 hour bike tour. Zip down Saigon River by a speedboat and witness traditional life on water. Really, biking via the countryside is a good way to get off the beaten track and witness what Vietnamese life is really like far from the busy cities. After being picked up at your hotel, your tour starts with a 1.5-hour speedboat ride along Saigon River to Cu Chi Tunnels. Then, you nibble on a light breakfast, fresh fruit and Vietnamese iced café on board while watching the riverside landscape change from vibrant city to lush jungle. 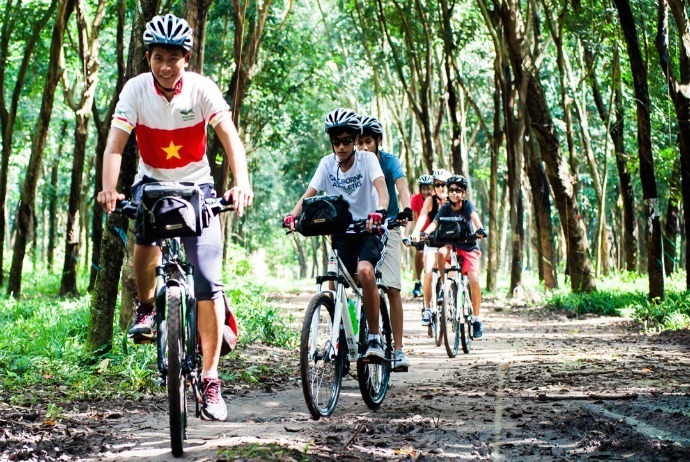 Hear commentary from the tour guide about countryside traditions and daily life along riverbanks till you get Cu Chi, where the tour guide will guide you through a mountain bike ride of about 2.5 hours using a high quality mountain bike plus with helmet. If you pedal at leisurely pace for about 25-30 km (15-19 miles) on the back roads and dirt trails, then you will see plantations, villages, and green rubber forests of southern area of Vietnam. Hop off for taking photos and enjoying a light snack before coming back to Cu Chi Tunnels. Following your tour guide, you will explore tunnels, visiting a few underground bunkers used for meeting rooms, kitchens, living quarters as well as medical treatment. Also, you can see firing range and a few displays of booby traps and weapons, then taste the local cassava root that sustained Viet Cong soldiers during the long years of Vietnam / American War.